Marko Kolanovic and Bram Kaplan, from J.P.Morgan’s Global Quantitative and Derivatives Strategy team, ask why the Q4 2018 sell-off and subsequent Q1 2019 rally in the S&P 500 was so violent and how it occurred without a large shift in positioning. Their answer suggests there is plenty of scope for the S&P to go higher. Kolanovic and Kaplan compare the recent 2018/19 move with five previous sell-off and recoveries since 2018 (see Chart). They point out that the duration of past corrections is consistent with the recent move, reaching new all-time highs in one to three months. What is different this time, however, is market depth, which is shown in the inset table of the Chart. 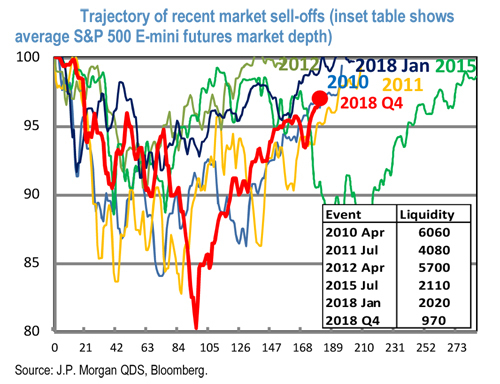 Specifically the average liquidity during the recent sell-off and recovery was less than 1/3 of the liquidity in previous episodes and about half of the worst liquidity drawdowns over the last decade. So, they say, if liquidity was only a half or a third, they think it is reasonable to expect the speed of market moves to be two or three times faster. In fact, Kolanovic and Kaplan think it is plausible that just short covering, buybacks, dealers’ gamma hedging, and some limited re-leveraging drove the entire recovery from the beginning of 2019. Liquidity thus explains how the market could go down and up so much on a relatively small change in positioning. Furthermore, Kolanovic and Kaplan believe that if the market avoids significant disruptions (e.g. from Trump, Brexit, etc. ), the S&P is likely to drift higher on continued re-leveraging; buybacks are continuing at near-record levels and CTAs may soon be adding to equity positions. They point out that institutional positioning is still very low, which could be a source of additional demand, and retail flows (which dealt a blow to the market in December), are still negative and may drive the final leg up in the market. This opens the possibility that the current rally can continue through the Spring.